FC Halifax Town won 4-2 away to Brighouse Town in an action-packed pre-season friendly at Hove Edge yesterday. 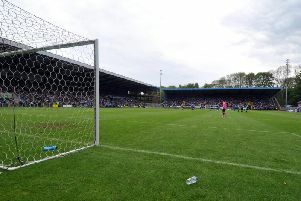 There was a record crowd of 864 for the fixture, played in glorious sunshine, and plenty of talking points including a penalty miss and a spectacular Adam Morgan goal for Halifax. Morgan’s effort from his own half put the visitors 4-0 up on 64 minutes but Brighouse, beaten 8-1 in last year’s fixture, scored twice late on to emerge with credit. Billy Heath may have been frustrated at his difficulties in bringing in players this summer but at least he was able to name a different team for each half. Brighouse’s new boss Vill Powell, in contrast, had only six named players on his teamsheet with the rest trailists after an exodus of last season’s line-up. Halifax missed a glorious chance to go ahead after only two minutes when former skipper Liam King’s low penalty was saved by Harry Stead, who collected the rebound. It was left to Scott McManus to give the visitors a 2-0 lead with goals on 15 and 27 minutes, the first with a high finish and the second with a neat effort past Stead. Halifax new boy Bohan Dixon, an aerial threat like Tom Denton, was denied by Stead and then King made amends for his penalty miss by making it 3-0 on 42 minutes. Just ahead of the break Brighouse’s man of the match Stead denied King and Josh McDonald. Heath made 10 changes for second half, with McManus the player putting in a full shift as he moved to left-back. Morgan was denied when Stead pushed his effort on to the cross bar but on 64 minutes he produced a spectacular over head kick from 50 yards out. His looping effort just got the better of Stead and went into the top corner. Brighouse were matching Halifax now and playing some good football. They were rewarded in the 75th minute when Jamie Underdown crossed from the right and a trialist centre forward got the better of the Halifax defence to head home. This gave Brighouse more impetus and confidence and they delighted their fans with another goal in the 83rd minute when ex-Huddersfield Town player Jacob Buchanan dibbled into the box and scored with a well hit shot. Halifax, who were without Kevin Roberts (ankle), now head to Gainsborough Trinity on Tuesday. Brighouse host Worksop on Friday. Brighouse Town: Stead, A Trialist, Grimshaw, Haigh, A Trialist, Griffin, Ord, A Trialist, A Trialist, A Shaw, A Trialist. Subs: Not confirmed. Halifax - first half team: Sam Johnson, Cliff Moyo, Josh Wild, Liam King, Martin Riley, Scott Garner, Connor Oliver, Bohan Dixon, Tom Denton, Josh McDonald, Scott McManus. Second half: Tom Nicholson, Ross Barrows, Jake Hibbs, Danny Clarke, Matty Brown, Nathan Hotte, Shirz Khan, David Lynch, Adam Morgan, Trialist, Matty Kosylo.